When I returned to Sydney in early 2000 with the gaming bug in tow (picked up during a one year sojourn in Auckland), it felt like there were only a handful of gamers across all of Sydney. I was lucky enough to be made welcome, and I’ve been gaming with that group on Sundays ever since. Recently we had our Sydney-wide mass auction no-ship trade night. It’s similar to a maths trade but in an auction format, where trading games before deadline is encouraged. Anyone can sell or trade games throughout the auction, as long as you turn up on trade night to hand over the games so no one has to pay for shipping. Works great, easy to organise, easy to manage. With a mass of gamers descending on our home Chatswood turf, welcoming back and playing with gamers from all over Sydney reminded me of how far our gaming scene has come. I used to think nothing of travelling far across the city to meet up and play some new stuff. Nowadays the riches abound. There are active public gaming groups on every week night (barring maybe Mondays?) in a 20 minute ring around my home, and there are any number of local gaming buddies I can call on to get a longer game to the table on a weekend if needed. Gone is the need to ever long haul again!! Riches indeed. Sometimes you just have to sit back and count your blessings. It’s more a co-op activity than a game, but at least it’s a fun one where people can be clever. The guesser reveals a word to the other players, but doesn’t see it themselves. Everyone writes a one-word clue to that word. Before they’re revealed, all identical clues nullify each other. If everyone goes for obvious clues, those obvious clues aren’t going to be revealed. But if no one goes for obvious clues, the guesser might not guess the word! We collectively want it guessed as the aim is to get 13 correct guesses in the 13 rounds (or otherwise the best you can). There’s definitely reward for cleverness – with enough clever clues, the word is guessed and everyone feels good about themselves. While not much of a “game”, it’s something nice to pass the time with as an opener, taking up to 7 players as it does, and where people can join in at any time. Not one of Feld’s best. Use dice to move your meeple around an action track to eat point salad. Landing on actions that allow you to collect cubes / build manors and place influence early seems to give disproportionate benefit (as they stick around between scoring turns), and despite there being lots of action options to get things, you can be really hamstrung by your dice roll at times with not a lot of dice manipulation alternatives on offer. You can often feel like you’re choosing between second rate options because there’s little choice, and if you fall behind on the manor / influence investments it doesn’t feel like there’s a lot you can do to catch up. That frustration passes between various players from round to round (there’s 6 rounds, 4 actions per round) so the game struggles to win everyone over. It’s an ok euro if you’re looking for a bit of variety in your Euro-ness but it’s not something I need to explore. Everyone’s playing 20+ questions trying to guess the word. Well the villagers are anyway. The werewolves know the word and want a fail, but can’t be too obvious with stupid questions or deliberate misleads for being called on it at the end. The mayor says yes/no to each question. The seer knows the answer and will try and get the villagers to the right answer without obviously being a seer to the werewolves. In other words, the standard werewolf setup but replacing the role-play with 20 questions. Which makes for an ok activity for a bit of fun (play as many rounds as you like), but going through the 20 questions routine for round after round can become wearisome, so it’s not one I need to go looking for either. Pulling off a great seer job and getting away with it can be very satisfying though! Larry: Various thoughts on Patrick’s games this month. The Colonists – Absorbing game, but I so rarely have the opportunity, or even the inclination, to play something that runs this long. All of my games have been with two, for only two eras. I think skipping the first era (and using the rules in the box for jumpstarting the beginning of Era 2) makes sense for me, as the later eras are more interesting. So a game I enjoy, but probably no more than once a year, or even less. 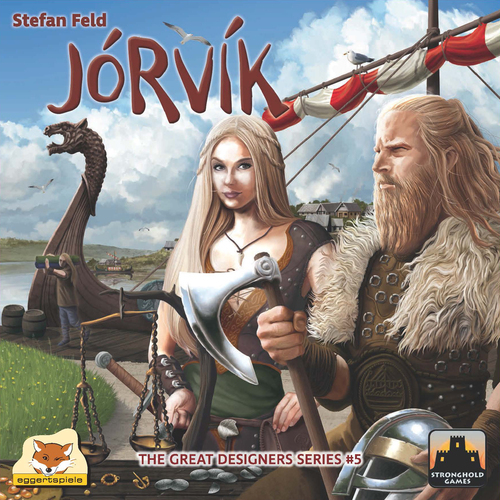 Jorvik – I’m a much bigger fan of Speicherstadt than Patrick is. I love all the things he dislikes–the auction tricks, getting in an opponent’s way, taking advantage of money issues, anticipating combos, and so on. What I do not like at all, however, is the expansion, as I think it destroys the elegance and basic concept of the game. If it’s incorporated in Jorvik, than I need to stay far away from it, particularly since the Viking retheme does little for me. Merlin – While this may not be Feld at the top of his game, I still think it’s a fine design, with more scope for cleverness with your actions than Patrick seems to acknowledge. I’ve been schooled by my opponents every time I’ve played, so I’m pretty sure the skill factor is high (or I’m just unusually bad at it). Werewords – I’m one of the small number of people who prefer Insider to Werewords, although I acknowledge the need for culling the target words in the former game. Neither is an essential experience for me, though, as I’m not a social deduction junkie. Web of Power– While I’m not sure I’d use the word “brilliant” to describe this game, it has definitely stood the test of time (my God, almost 20 years now) and remains our go-to game when we have 3 players who want to play something short and fun while waiting for the other table to finish up. It’s consistently enjoyable. In short, the original “super filler” still fills that niche very well. Joe Huber: I agree wholeheartedly with the brilliance of Web of Power – but for me, it’s a very enjoyable game with four or even five as well. I was not nearly so impressed as Patrick was with Blue Lagoon, Merlin, or River (sic) of the Ganges. The Colonists: I agree with Patrick’s comments on this game. I am not averse to long runtime games provided that something exciting is developing during the game which holds my interest and provides an enjoyable experience overall. 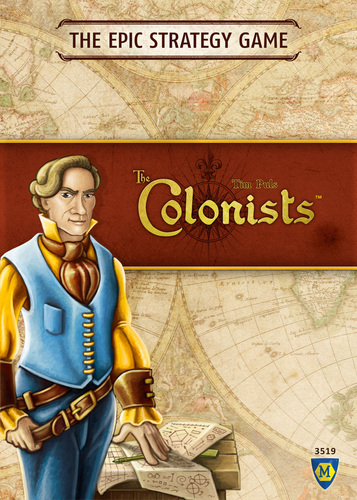 I feel that The Colonists is very much a wash, rinse, repeat style of game – yes, there are new things introduced as the game progresses but the mechanics stay the same. As a 90 minute game this would work for me, but longer and my interest wanes rapidly. Merlin: I really enjoy this game even though it falls short of my favourite Feld games of Luna and Trajan. With the multitude of dice based games being released at the moment, I think that it stands up well and offers something different. 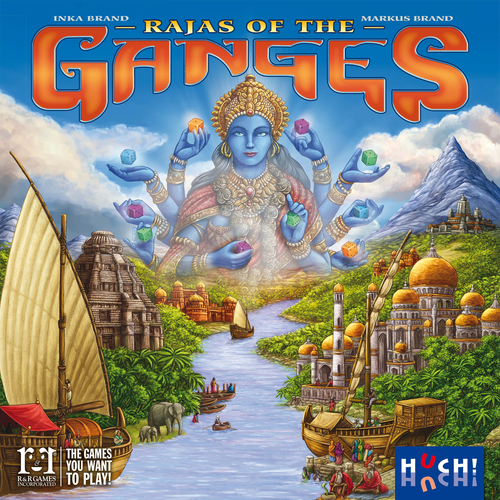 Rajas of the Ganges: I think Patrick has nailed it with his comments that this is a dice conversion game and not a resource conversion game. That said, it is a race game and the pace accelerates towards the end. I really like the twin tracks which act as the game timer and overall the game is different enough to warrant further table time. Erik Arneson: Web of Power is a classic, for sure. And Werewords has quickly become one of my favorites for larger groups. Mixing a word game with Werewolf and 20 Questions works amazingly well. I’m impressed with Knizia’s upgraded designs. 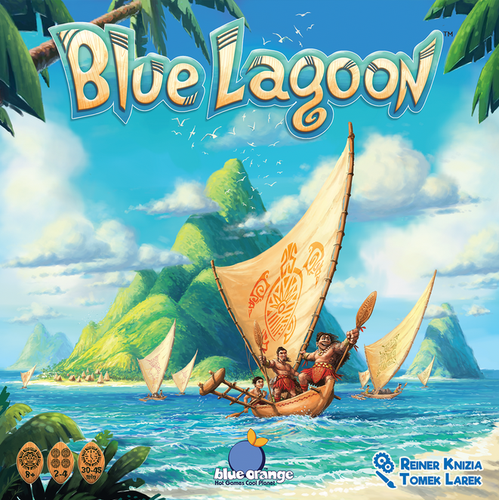 Blue Lagoon is an excellent abstract game that scales very well. It may lack clarity as there are so many ways to score points. If you’re an abstract game purist it may not work for you. But if you don’t get obsessed with counting points, you want to blend analysis with intuition, and you play it reasonably quickly, it’s a lot of fun. I’ll give it a tentative 8. 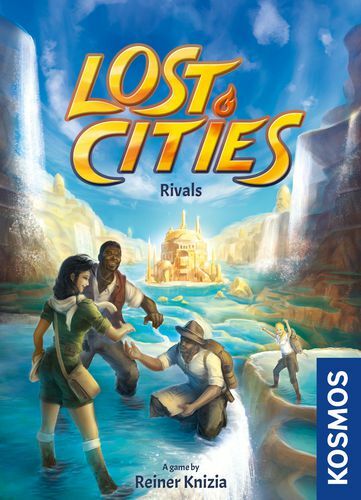 Lost Cities:Rivals is very interesting. I think it brings new life to the Lost Cities/Keltis family. It’s neat how just a few rules tweaks results in a very different game. That gets an 8 as well. My wife and I played Raja of the Ganges ten times and derived great enjoyment. The race element is fun, and the dice manipulation/conversion is an intriguing puzzle. It’s a clever game with a neat fun factor. I’m not sure I’d want to play it with more than two. I’ll give out a third 8. We found Eastern Wonders a disappointment, adding complexity, time and fiddliness to the sharp and crisp Spice Road. It’s a 5. I love The Colonists and generally prefer to play the full game because I love how each round builds on the next and the challenge of setting yourself up so what you need is within reach. There are so many interesting decisions and things to think about that I haven’t found down time to be a problem, although most of my games have been two player with a couple of three player games thrown in. I wanted to love Merlin. I’m generally a Feld fan, and the theme grabbed my attention, but it fell short for me. I often felt like I had far too little control and was choosing between two mediocre options; I had hoped playing with the expansions would fix that feeling for me, but it didn’t. I am really enjoying Rajas of the Ganges. I agree with the previous notes that it is a dice conversion game and a race game, and the puzzle of using the dice and laying out buildings to maximize your scoring continues to interest me. I have only played Werewords a couple of times as it is not my favorite style of game, but it is popular with several members of my game group and I can see this being a good choice to play with a larger group or with more casual gamers. Web of Power is probably highest on the list of “games I do not own but wish I did”. It has intrigued me since the first time I played it, and continues to hold up well after dozens of play and twenty year. Morning. Of the selection this time, can only really comment on Eastern Wonders and Rajas of the Ganges… the former was pretty disappointing after all the hype (imho), but Rajas was a very pleasant surprise – multiple routes to victory, multiple strategies, and choices galore throughout – we really liked this one! And annoyingly, no-one perceived the value of the ‘5’-space (build over tiles already on your map), until practically the very end of the game… and are itching to play it again because of that! 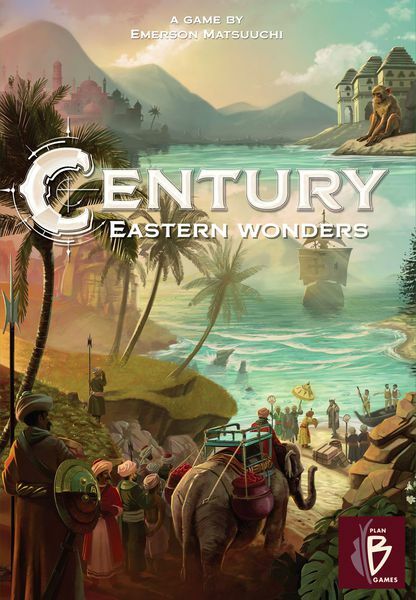 Most comments I have seen say the combined Century Spice Road/Eastern Wonders (Sand to Sea, I believe) is the best way to play it – any comments along those lines from the Opinionated?